I posted the copy with the incorrect math on my Twitter and Instagram feeds…oops. Today was a very long day that began for me at 2:30 this morning. It began so early only because my body woke me up before my alarm clock had the opportunity. I tried to go back to bed but decided it was useless when I was laying there, wide awake at 3 am. I determined it would be better for me to just go ahead, get up and shower, then fix myself something to eat because I knew I’d need it for the morning I had in front of me. My husband had sleeve surgery of his own today. We had to be at the hospital at 5:15 this morning to check SB in…so early! I drove us to the hospital, which thankfully is only about a 15 minute drive from our house here in town. We arrived, got him checked in, and began the long pre-op waiting process. Around 7:40, Dr. Nicholson came in to visit with us to discuss with my husband what he would be doing, how and why he would be doing it, what medications he’d be given during the procedure and asked him if he had any questions. Having seen me go through the same exact thing last month, my husband didn’t really have any questions since he already knew what to expect procedurally. The anesthesiologist came by, asked my husband the requisite set of questions about his medications and whether or not he’d eaten/drunk the night before or the morning of surgery. He then took off to get the sedative that would lead my husband into temporary darkness before giving him the really heavy duty anesthetic in the OR. The OR nurse told us to “get your hugs and kisses in now, because we’re about to roll.” We did, and sure enough, a couple of minutes later, the anesthesiologist and OR nurse reappeared and whisked my husband off to surgery. The next hour and a half was one of the longest 90-minute periods of my life. My mom was with me today so that my husband and I didn’t have to be alone today. My husband’s family was not able to be here for his turn at surgery like mine was for me so it was good to have some family around. The hospital where our surgeries took place has a monitor in the family waiting area, and you are given a card with a number on it that identifies the patient you are waiting for. 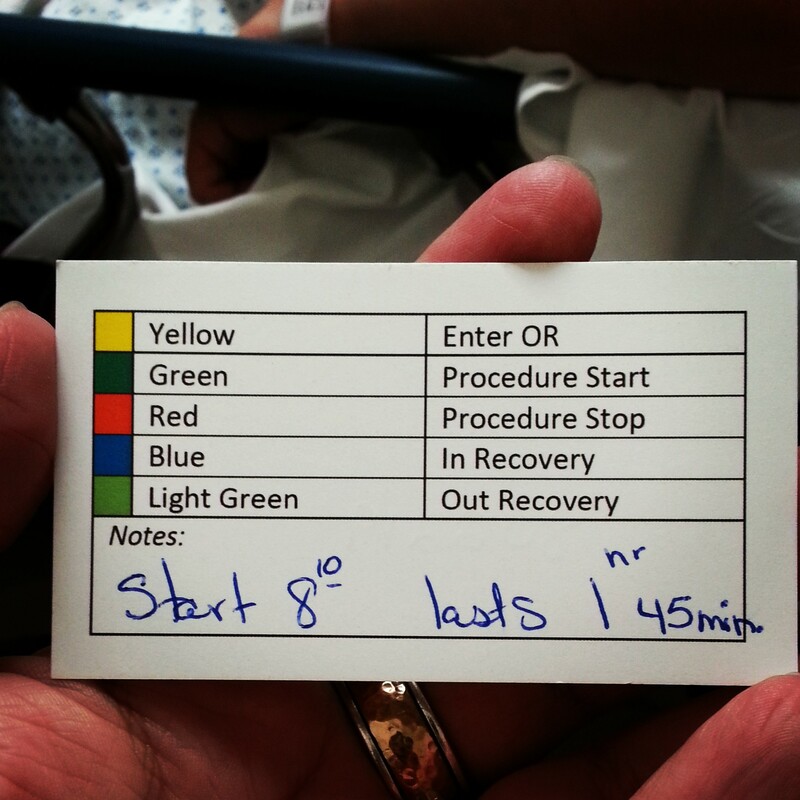 The color coding lets you know where in the process your loved one is. You have to keep an eye on the monitor in the lounge so that you know how far along your loved one’s procedure is progressing. It’s a very clever system. After I’d wandered down to the cafeteria at 9 am for what ended up being Second Breakfast (since first breakfast was at 3:45 am! ), I looked up at the monitor and noted that hubby’s procedure was nearly done. I knew my surgeon was amazingly efficient at what he does but I didn’t realize just HOW efficiently he did his work until he came in to visit with me at 9:30. Dr. Nicholson appeared and let me know that hubby’s surgery went smoothly, that there were no complications and no leaks, and that he did really well during the procedure. I breathed a sigh of relief, because I was a total ball of nerves while waiting. I then thanked Dr. Nicholson for performing my procedure and gave him a progress report of sorts. He was excited that I’d lost as much weight as I had in such a short amount of time and congratulated me. He told me that he was excited for me and to keep up the good work. Then he darted off to another patient’s surgery. After that, I got a call from the recovery room nurse who let me know that my husband was recovering well and that he would be moved to a room soon. Once we found out where he was moved to, we went up and waited for him to arrive. He finally arrived around 11:30 am, groggy, sleepy and sleeved. The poor guy looked like he’d been run over by a Mack truck and I know he felt like it too. I knew exactly how he felt because that was me 5 weeks ago. Early tomorrow morning I’ll return to the hospital because I want the opportunity to visit with the other health professionals that will swing by and check in on him–the dietician, internal medicine doctor, our surgeon’s PA and the nurse practitioner. I want to see what they have to say so that if there is anything I need to be watching for at home, I can do that. You see, the good thing about doing this as a couple is that you get to see the procedure from both sides–as a patient and as a caregiver. Because I’ve gone through it already, I know exactly how and what he is feeling both physically and mentally. He knows what to expect in terms of mobility (or lack thereof), how often to drink, and what medications to take and when. And because he’s been the caregiver, he knows what kind of care to expect and I know what kind of aftercare to be sure to provide. He also watched me struggle through full liquids for 3 weeks and knows full well what all that entails, and I know exactly what to be sure to have the house stocked with when he comes home from the hospital. I will know how to prepare soft foods for him and he will know what to come to expect during that stage because of what he’s seen me eat during this time. He’ll also get to see me graduate to dense solids and see what foods I can and can’t tolerate so that he can get an idea of what foods he can try and what foods to avoid. Eventually we’ll both finally be on the same page, and the new normal for us as a couple will be something we navigate together. I am looking forward to what the future holds for both of us in terms of our health and happiness as a couple. I think this shared experience will strengthen what is already a fantastic relationship and definitely will deepen the connection we have with one another. I am proud of my husband for the choice he has made to improve his health, and excited for him. I only hope that his experience with his sleeve is as positive for him as mine has been for me. 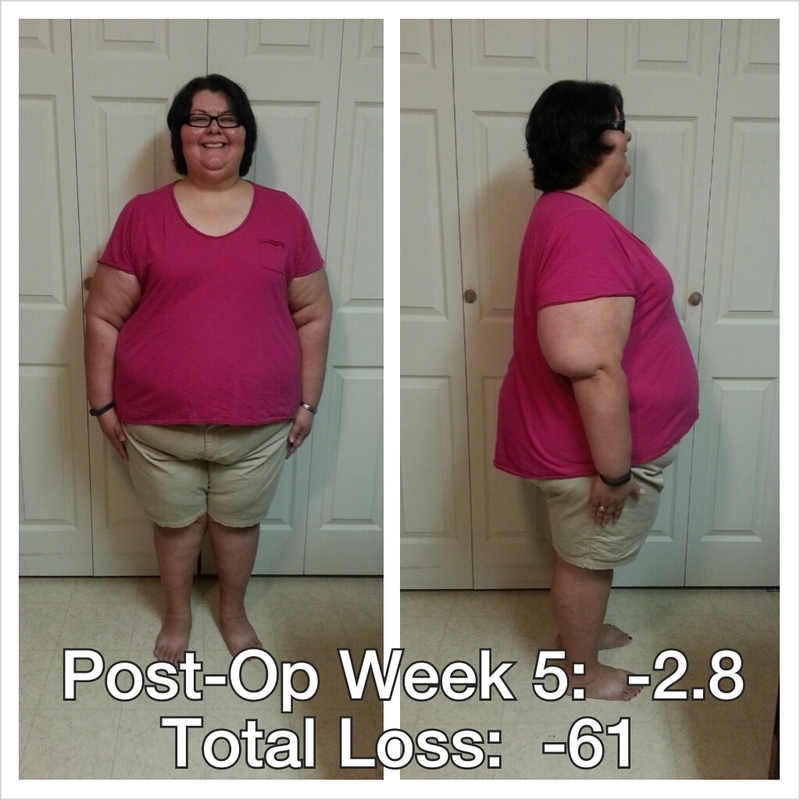 This entry was posted in family, vsg, weight loss surgery and tagged photo post, progress report, sleeve twin, spousal support, VSG, WLS, wls spouse. Bookmark the permalink. You guys are so genius for doing this together. I wish they had done a reality show following your journey! I’m praying for your hubby tonight and for a swift recovery. Thank you for thinking of him. He’s having a rough time but hopefully tomorrow will be better so he can come home. I told him about your reality show comment and he chuckled (as much as his belly would let him!). I joked that if we had, the money we could have made would have paid for the surgery, haha! Wow! Him, too? How cool you can go through this together. I hope his recovery is smooth and yours continues to go well. Thinking of you! Yep! We decided back in January we would both have the surgery but arrived at the decision separately. I’m glad we are doing this together and will be curious to see how it will affect our relationship. I’m thinking that it will strengthen it. 🙂 Thanks for the well wishes!